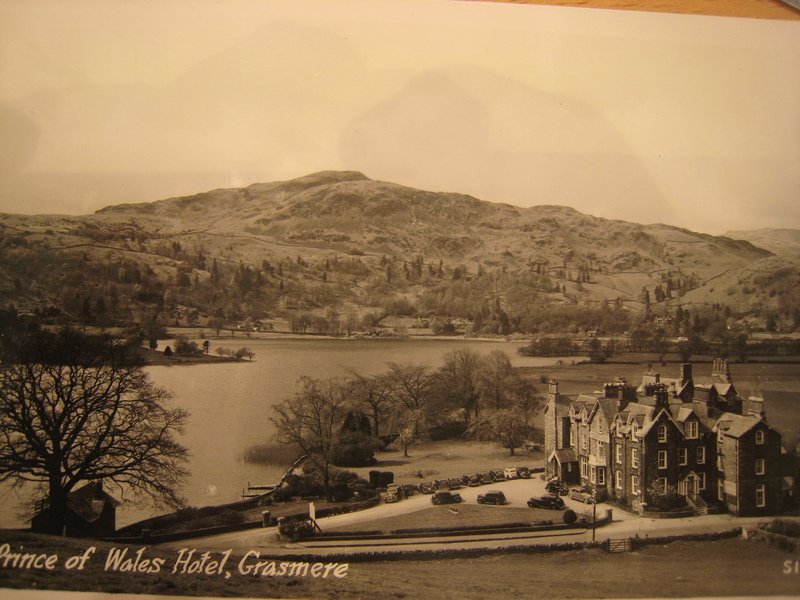 Prince of Wales Hotel Grasmere, Then and Now. Working in Grasmere you get used to the usual questions. “Where is the gingerbread shop”, “Where are the toilets”, however over the past year a new question has joined them “What on earth has happened to the Prince of Wales?”. 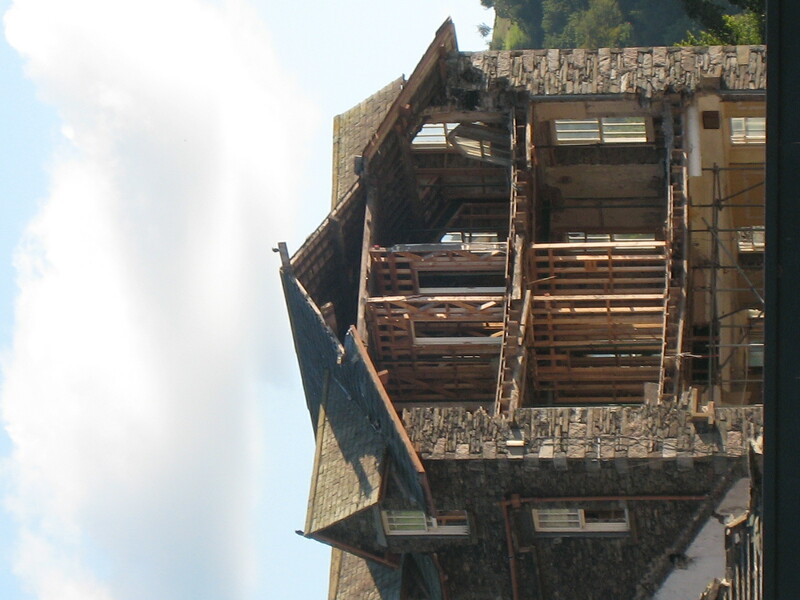 Built in 1855 and occupying an enviable position with frontage to the Grasmere Lake, Browns Lake Hotel was built as a testimony to the 19th Century tourist industry that Wordsworth did so much to inspire. 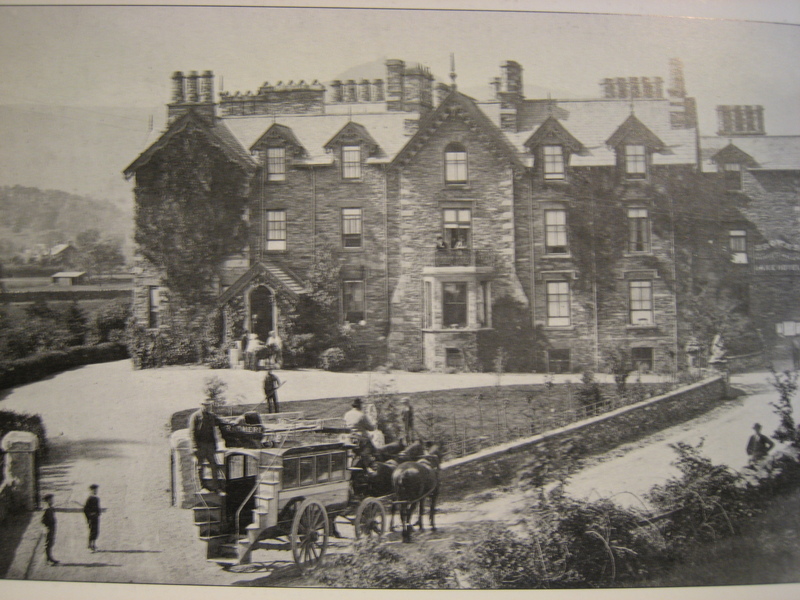 The hotel was built by Levi Hodgson who was resposable for building other impressive buildings still standing in Grasmere. Cragside, The Hollins, and Woodland Crag were all built by him and if you look at the church bridge you can see his initials there as he was responsible for widening it in 1832. Prince of Wales Hotel Grasmere. Not long after the hotel was built they had a Royal visitor Edward V11, The Prince of Wales , there was great excitment and Moses Bowness the photographer photographed the young prince on his visit in 1857. Edward Brown the owner of the hotel then changed the name to The Prince of Wales Hotel. 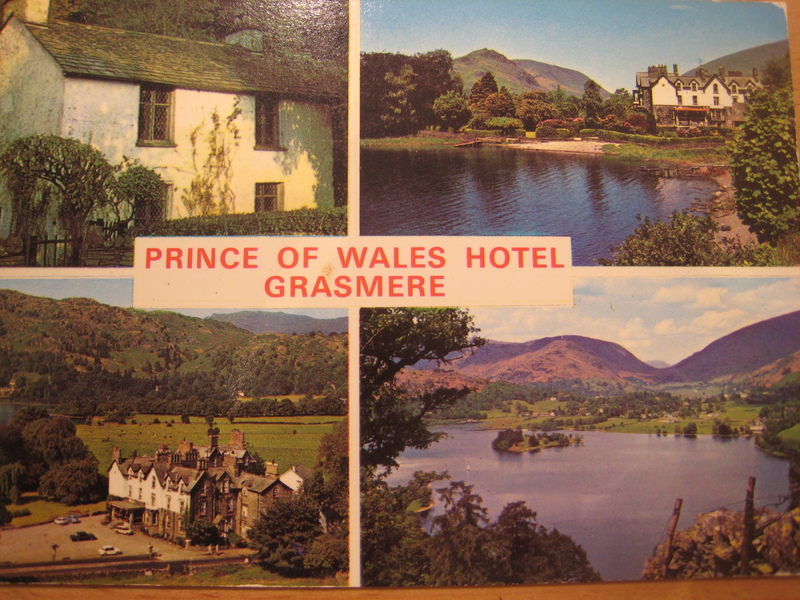 The name Prince of Wales remained until fairly recent times when it had a brief change to the Thistle Grasmere, followed by The Waterside Hotel. The Town End area of Grasmere where the hotel is situated was made a conservation area in 1984. And now we jump to recent times. Having been sold, plans were submitted to improve the hotel. Present day Prince of Wales Grasmere. The original plans, doubled the existing floor space and immediately there were protests. The Waterside Action Group was set up and even Rolf Harris and Sir Melvyn Bragg got involved. Lakes Parish Council, The Victorian Society, Friends of The Lake District and Grasmere Village Society put forward their arguments against the plans, saying it would dominate Grasmere Lake in an overbearing manner. Eventually after three attempts the plans were passed on the premise that “All the bulk of the original building will be left intact”. Current state of the hotel. Apart from knocking through the hotel and leaving this fine Victorian building to the elements work seemed to have stopped. 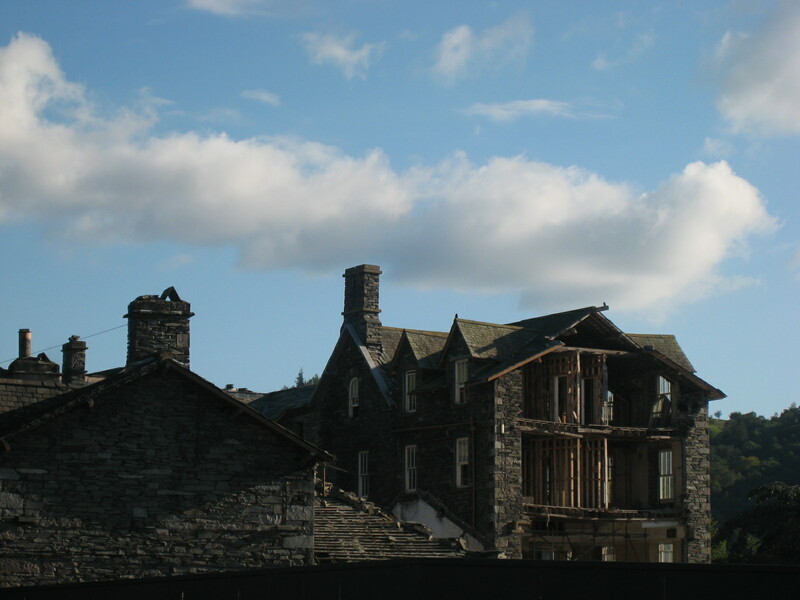 What a couple of years ago looked like being a beautiful 5 star hotel according to the plans has been left to rot. Recent events have seen the death of one of the owners and I am afraid that Tony Ball hit the nail on the head right at the beginning when he said “This has all the makings of a Trojan Horse”. Now we have an eyesore as the entrance to our beautiful village as the first thing people see. Situated directly opposite Dove Cottage and the hoardings dominating the landscape. It used to be the main stop for coaches travelling through to Scotland to spend the night. We always knew at about 5pm there would be a sudden flurry of customers who had just checked into “The Prince” and usually remained open until late to serve them. Reekies weavers used to visit the hotel with their wares to sell in the evening. It has taken the buzz away and has impacted on many of the businesses. Will we ever get the coaches back? who knows. We used to always blame any mischief in the village on “the staff from the Prince” and I would give anything to have them back. Boathouse Prince of Wales Hotel, Grasmere. 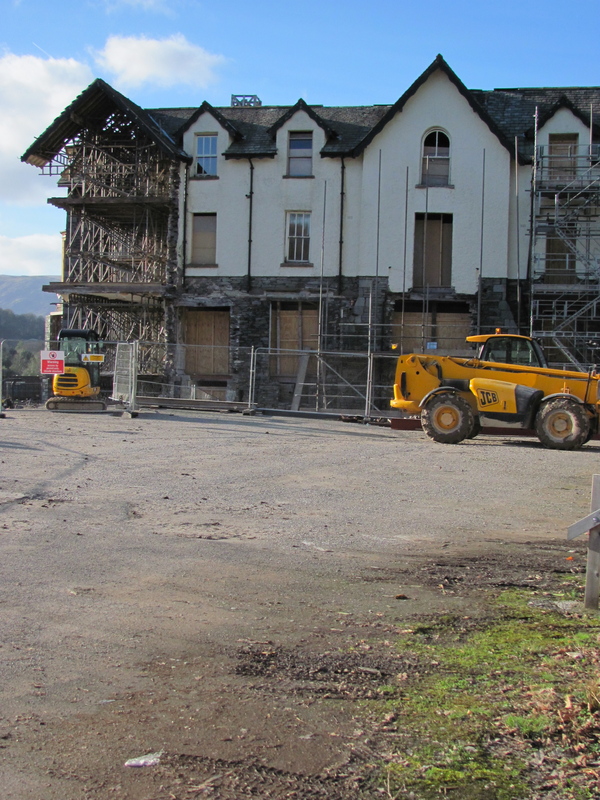 Let’s hope that some day this symbol of early tourism in the Lake District is transformed back to her former glory and a new chapter begins for The Prince of Wales, Grasmere. Well work has started and to keep everyone up to date here are a few recent photos. I do have a habit of calling the hotel the Prince of Wales, but believe the name The Waterside Hotel is what will be retained. As you can see things are actually moving, but there is still a long way to go. I will keep posting photos as the work progresses, let’s hope we are soon seeing a big improvement. Good news. Real progress is finally being made. First the tatty hoarding round the development was spruced up with a coat of paint so that it wasn’t such an eyesore and work now seems to be progressing quickly. You can see the shape of the old hotel appearing at the front elevation. Apparently the opening date is being kept a secret. Good News! 26/07/2012 The Hotel is now open under the new name of The Daffodil. See new blog post. 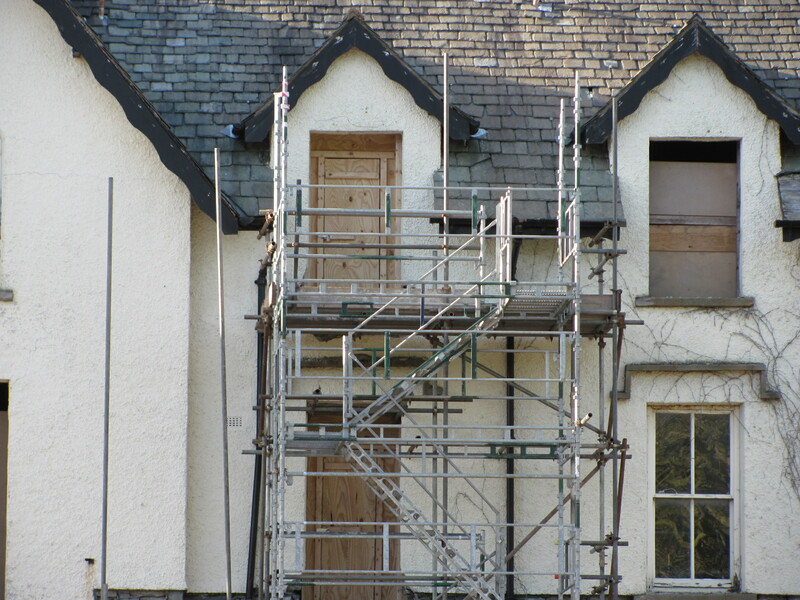 The Daffodil Hotel Grasmere A new Beginning. An interesting and sad tale. Makes me wish I could win the lottery just to fix it up! (The personal plus side being I could then live up there too 😉 ) The building doesn’t deserve this, never mind the local community! Lovely pictorial progression of time too. It has the most enviable position with frontage on to Grasmere Lake. Hopefully it will all work out and once again be a credit to Grasmere. My late husband and I used to stay there and as my daughter has just gone up to Grassmere I said give the Prince of Wales a wave from your Dad. It is really upsetting it was a lovely place to stay and we were alwasy made welcome. I have very dear memories of it. I’m not sure I can do much to help the present situation, but I am researching for a PhD at Lancaster into the development of tourist accommodation in the Lake District. So, this story interests me, especially as the hotel played such a vital role in community life during the 18th and 19th centuries, when, among other things it was regularly used as an auction house. I would welcome hearing from anyone with information about the early years of the hotel – ideally, a box full of old documents, accounts, receipts, guest books…etc., but that would be like winning the lottery! Good luck with your PhD and thank you for taking the time to read my blog. The last thing I heard was that the project would not get fully up to speed until the end of next year or even later. What a disgrace when you consider all the lost trade to Grasmere. As is stated the building is visibly falling down, doesn’t the planning authority have a say in the buildings future after all they gave permission for the work to go ahead? Interestingly enough, there has started to be activity on the site. Word is that work will begin in the new year. How it can be restored to how it was before beats me. But fingers crossed it starts proceeding, and let’s give them the benefit of the doubt. Watch his space…. I used to be the General Manager at the Thistle Grasmere from 2000 to 2004. I was delighted when I heard that the refurbishment that I proposed 10 years ago was finally being done but am so disheartened every time I drive past the hotel. Had such a great time there, my maintenance engineer named the two rowing boats we owned after my children. For me its got the best position in the Lake District and has so much potential. Thanks for your comments. It is heartbreaking to see. A little activity has been noted since xmas with windows being boarded up, vehicles on site, but nothing major so far. My worry is that any goodwill that might have come from the village has been eroded. A lot of hotel bookings, come from visitors chatting to folk in shops etc, and I feel it will take quite some time before there is confidence in promoting it if/when it is up and running. I agree with your comment about location, It really is the most breathtaking setting on the lake. Lets all hope things speed up in the Spring and Grasmere has a “Prince” to be proud of again. Will keep this page updated with progress. This is heartbreaking to see. I got married there in August 2005. It was the best wedding I’ve even been too. Many of my guests still tell us of the great time they had. The hotel had character inside and scenary outside. The squeaky floorboard and wonderful staircase are gone forever. We even had walkers pop in for a cheekly look. Its a shame that this has all been lost. 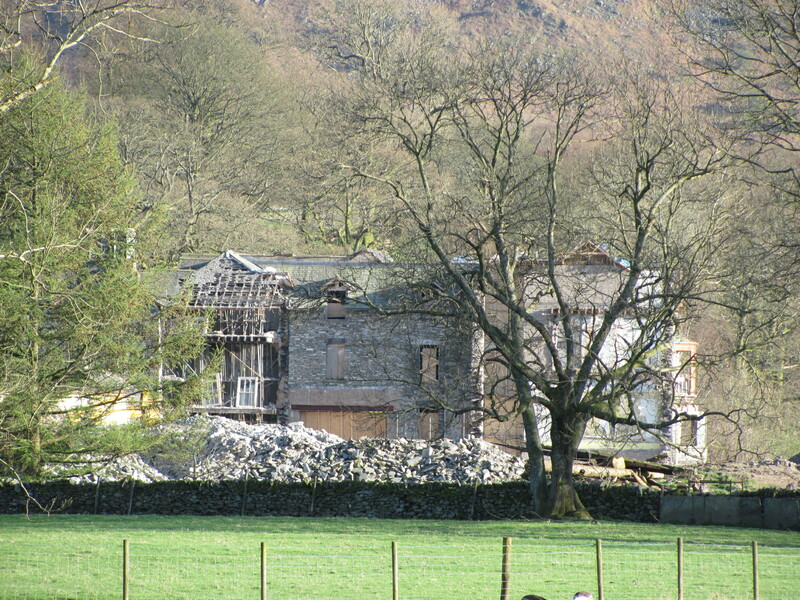 I hope it is re born into something better soon and Grasmere gets back this hotel. Nice to know you have such good memories, what a setting for your wedding. Here’s hoping things get going and we have a hotel to be proud of again, perhaps to celebrate your anniversary in?. But at the moment, who knows when. It is heartbreaking to see the state of the beautiful and historic hotel in it’s present condition.I have many happy memories of holidays there from when I was a child exploring the wonderful gardens. I also stayed there for my 30th birthday, and again for the Millenium New Year celebrations. I’m really shocked that such a long -standing and much loved hotel has been allowed to deteriorate like this and think it’s a disgrace.I hope work will start up again soon and also that it won’t spoil the original character of the building. That’s wonderful that you remember the hotel from childhood. It’s to be hoped that the “new” hotel retains the original character as you say. Work has certainly commenced, so we shall see. We stayed at the Prince of Wales for a few nights just before Christmas some years back. It was cold, the heating was off, the rooms were heated by electric heaters, the hot water wasn’t, the champagne buckets were being used to catch the water coming through the ceilings, the bar didn’t even have sherry, the main dining room was being prepared for Christmas Guests, for whom we felt very sorry. The staff were in shirt sleeves and obviously frozen. One morning, no staff appeared to serve breakfast until very late, then arrived looking as if they had overslept. In short, it’s time was up. Fire regulations had destroyed the once elegant staircase, and when I drove past last week, I had hope that this once proud building might be given back its pride. Oh dear, what a terrible experience. Work has stared on the building and hopefully things will move quickly now. Watch this space for updates. I can not believe what I have just read. I worked at the POW on 2 occations in the 80@s and I can honestly say they were the best times of my liffe. I fell in love there not only with the location, the village and the hotel but with a beuitfull girl,(but thats another story). I have so many found memories of the people I worked with. It was my home, so sad. I truely hope it can be saved. I have just got incontact with another ex member of staff I haven’t seen in over 22 years and she is comming over in July this year with her family to take a trip down memory lane. I am glad you have such happy memories of Grasmere. Work has certainly started on the hotel, so here’s hoping things progress quickly. I used to work at the POW between 1989 and 1992. some good times, and made some good friends. I will have to come and ave a look at the new place when its finished. 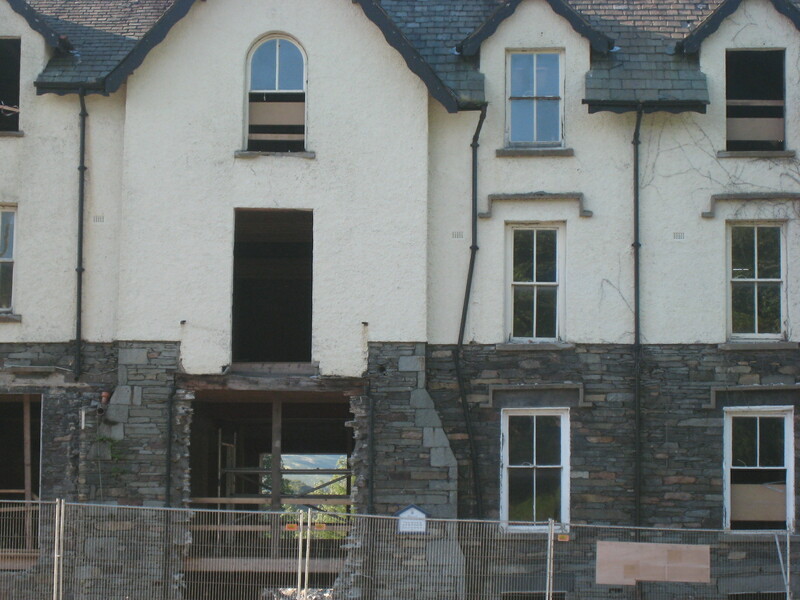 Work is certainly progressing now, but still a long way from completion. Will take new photos when there is something new to show. Thanks for that article. I used to go there most in the late sixties when the downstairs bar was one of the few locations in the South Lakes with music on. The times I’ve ridden past recently I’ve wondered what was happening to the old place. Yes it was a popular venue in those days. Perhaps the new owners may surprise us with live music again? Work is certainly progressing. Seems to be taking shape so here’s hoping. Had eaten there one evening many years ago,so said to my husband I wanted to go there for a significant birthday and when he made enquiries my hopes were dashed. When someone says think of a beautiful place I think of the view from the lounge across the lake with the suns rays reflecting off the water. Hope it is resurrected. Work is now progressing quickly. 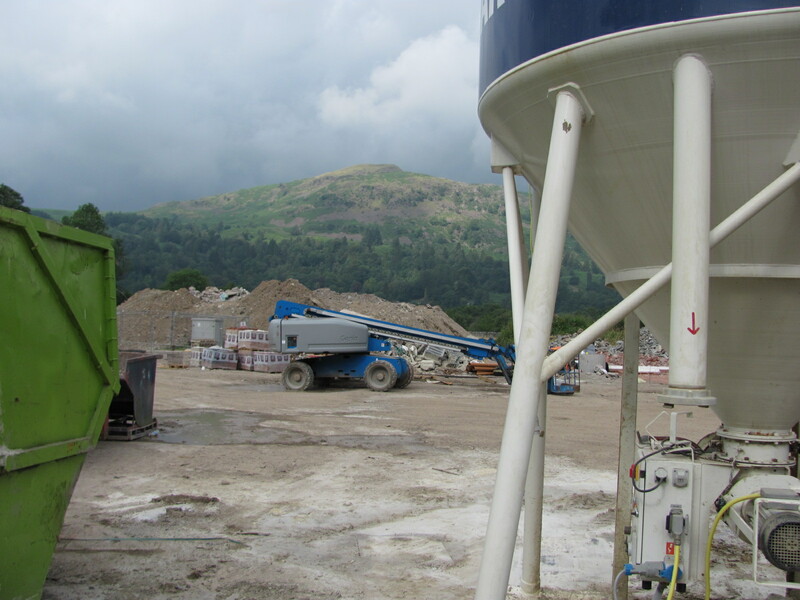 Probably the largest crane Grasmere has seen is in place and the shape of things to come is starting to appear. I hope to take some up to date photos soon. I’ve been past a couple of times and I’m amazed at how big the extensive new works look, girders everywhere. I hope we end up wih plenty of facing and not just white painted pebble dash. Agreed, it needs to be restored sympathetically, it does look promising now. Great news. 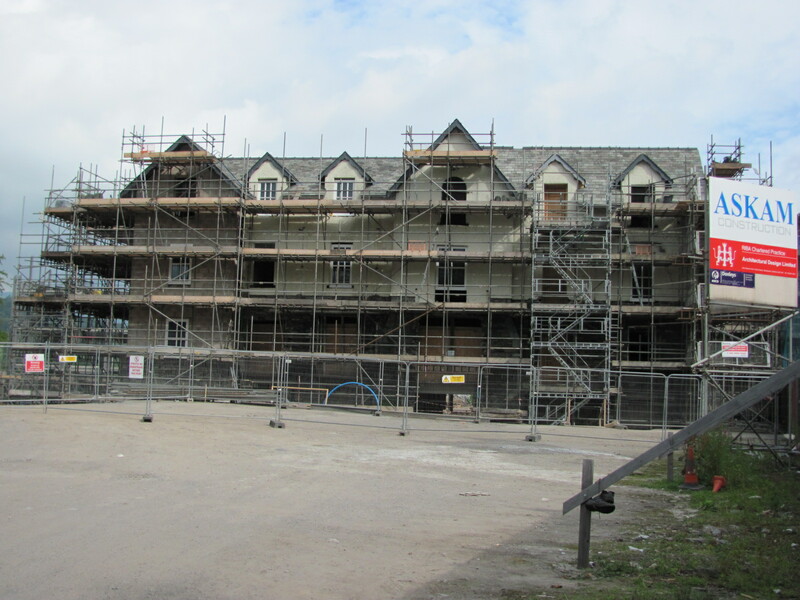 As regular visitors to the lakes we’ve wondered for several years what was happening to the Prince of Wales. It is going to be a very large hotel if the steel girders are anything to go by! Have you any photos of the plans? We used to stay at the White Lion in Ambleside in the 60’s and the PoW had at one time belonged to the Smiddy family, who also owned the White Lion. No unfortunately I don’t have any copies of the plans. Will continue to post photos as it progresses. Can’t wait to see inside when it is finished. Hopefully they may let me photograph the finished interior, we shall see. Phil the restaurant manager died about 3 years ago, George Scattergood the head chef use to work in Patterdale a few years ago! oh how sad. I worked at the hotel with Phil (who always had his faithful dog Prince in tow). Phil was a great guy to work with. I worked there in the mid 90’s and have some great memories. I went back for the first time in years last year, and it was so sad to see it almost derelict. I can’t wait to see it restored and open to guests again. Oh, how sad!! My husband and I stayed here when we were on tour in 1998. We had a lovely “laura ashley” room overlooking the grounds and lake. I do hope it returns to its former glory. It’s looking positive. We have to wish them every success it’s a big project. Just hope it’s not too “big” on the lakeshore. Just browsing web to see if I could book hotel for my 25th wedding anniversary. … my husband and I stayed there on our honeymoon in 1986…. it was going to be a last minute suprise but will have to think of something else! 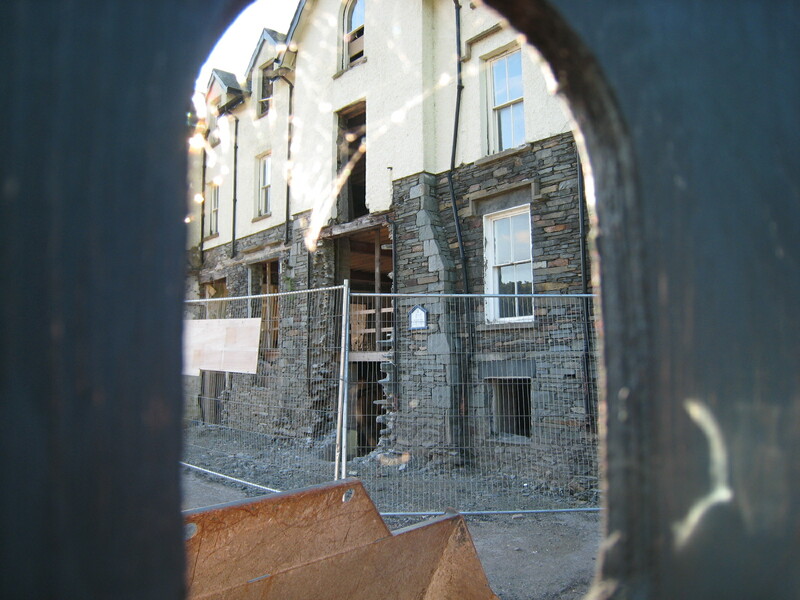 Havent read all the postings but looks like refurb and hotel wont be open for a while ….. will wait until reopened….. may book for 50th wedding ann. When it does reopen hopefully the honeymoon suite will have a bed that doesnt “squick” but then again….. memories! Not the best type of bed for a honeymoon, but as you say “memories!”. Will post a link to “new” hotel on the blog when it opens. Had a glorious time, and still told it was the best wedding people had attended. Cant wait for it to reopen, will be booking a trip as soon as I can! Hopefully it will bring back happy memories. 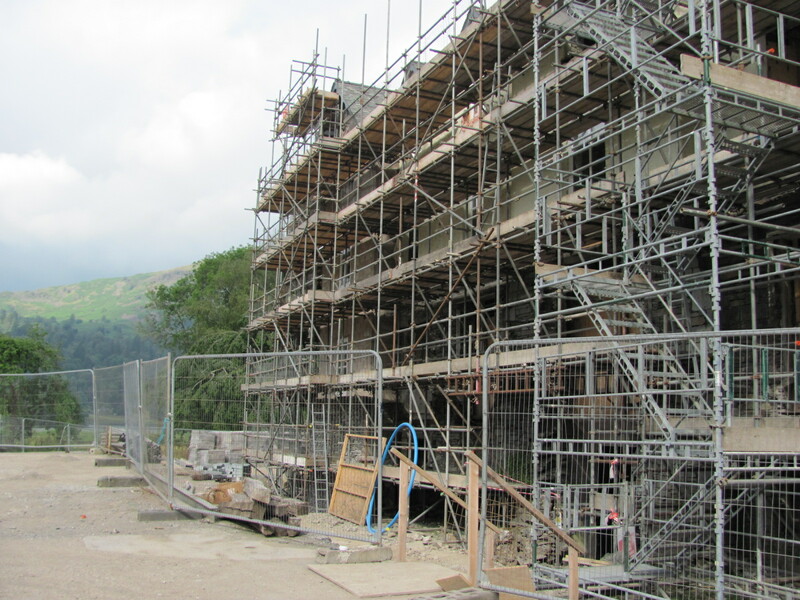 Grasmere residents will certainly be happy when it is up and running again too!. Yes, we used to love the bus trips staying there, was always a busy last hour or two when they arrived to stay for the evening. Hope you manage to get back to see the “new version”. Hi there Chris have you any new photos am really intrested in how the place is comming along. I will be making a trip up there before xmas to take a look see. Will try and take some new ones soon, fairly coming on now. Can’t wait to see interior. Hi Bob, I did and yes I remeber you, unfortunatley I believe Phil passed away a few years back, the last I heard of Chris he was still in the lakes but that was a least 15 years ago. I can’t believe you remebered me, hope all is well with you, I’m going up to Bowness between Christmas & New Year for Fish & Chips with my daughter so I will pop over and take a look see and hopefully take some picis. Have a bgreat Christmas & New Year and take care. That’s great am sure everyone will be very pleased to see your blog. Thanks for sharing. I seem to have filled this blog up so will be starting a new one along the lines of Waterside Grasmere A New Beginning, in the near future. It is certainly coming along now. Yesterday when I was passing the lights were on in the front bedroom windows and it looked as though it was coming to life at last! Can’t wait to see the end result. Hi to all who used to work at the prince of wales. my time working there was on and off for 7 years from 1989 to 1996 and I met my wife Zurine working there as well. sorry to hear about phil. I remember george the head chef as well. Hope he is ok. It is sad about phil. Always wanted to go back and see him but never made it now I am working in London. I met hundreds of people who worked at the prince from all over the world and all over the uk. Some of the people I remember are Mr Domingo of course, the manager, george the head chef, Andy from Carlise who had an aussie girlfriend called Mandy, James Turtle the Irish head porter who always kept most of the Globus tips!! !, and then most of the people I remember from the summer of 1996 which was my last time working there before my last year at college…..Ann Cassidy from Scotland, Miss Morrison from Scotland, loads of spanish and greeks!…..Tommy from Newcastle who played his chubby brown video for us after coming back from Tweedies on a friday night, Mr Downing, Stuart (kitchen porter), Katie & Geoff, Thirsty Kirsty from London, Donal (who now lives round the corner from me and also works in London) Ryan from South Africa, and Alice and George from Greece. There are so many more and I apologise for not remembering the names but I can see all the faces as I remember looking back now thinking about who was in Tweedies and the Lamb practically every night of the week blowing our cash wages (or pocket money as we called it!!). Many happy memories. If anyone sees this and remebers me please leave a message. Thanks. how very sad ……..the prince was the 1st pub i ever got drunk at !!!! going back to 1974 ish .. i remember a downstairs bar on the side if i remember right ? they had a disco on at the weekend i was 16 years old ! 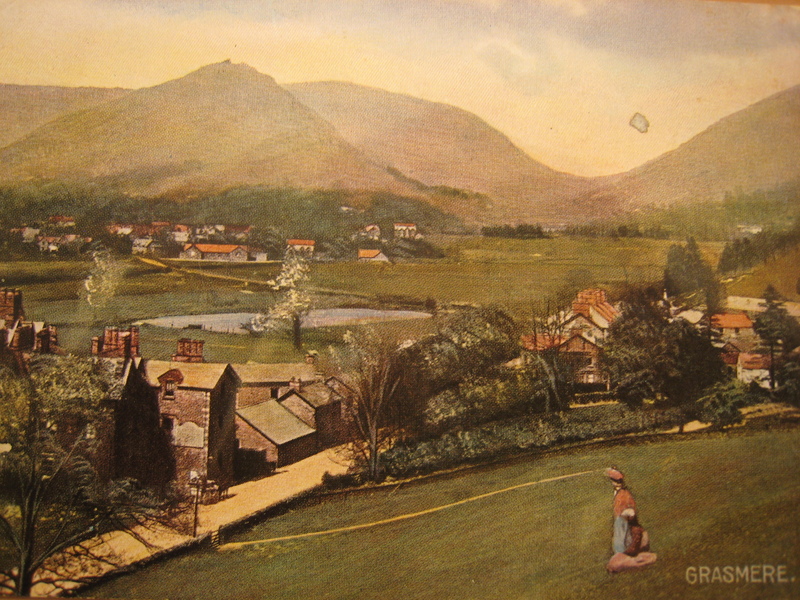 we used to visit the lakes and camp in grasmere . we used to ride up on lambretta scooters travelling from southport lancs , we met some local girls that lived in grasmere , i remember one of the girls parents owned a hotel in the middle of grasmere, fond memorys all round . grasmere is my favorite place in the whole world because life then was so good !! best wishes on the rebuild of the hotel . Glad you have such good memories!. The Prince was a very popular Saturday night venue in those days right enough. Myself and my husband worked at the prince in the 70s I have really good memories, downstairs in the disco was the place to go in those days I will look forward to seeing it when it reopens I think the name should have stayed the same !!!! waterside does not sound right !!!! Thanks for your comments. Yes it was definitely THE place to go in the 70’s. Will always be “The Prince” to most folk I think! I’ve ridden past a couple of times recently and have been quite impressed by the outside build. If they faced those few white painted cottages (or whatever they are) that front onto the main road it would be congratulations all round. Years ago (1994-95) I was a mischief making POW staff member (in bad taste I know…but we called it that between the staff) such a shame to see it like this. I have fond, yet hazy, memories of booze filled nights in Tweedies…and of baked potatoes and beans in Piggies. Sad to hear about Phil…..I bet all the brandy has preserved him though. :) Reading this blog is a trip down memory lane. I recently purchased the contents of a house in Milton Keynes and among them I found a pair of Victorian silver plated candlesticks with the badge for The Prince of Wales Lake hotel Grasmere stamped on them. I had never heard of it before. I’m always learning something from Google. Glad you found out a bit about the history of your purchase. Hope you enjoy them. I was married at the POW in 2002 and remember James, the manager who’s posted on this thread. It was a wonderful day, an all of our guests remember it fondly. The POW is a wonderful building and it’s been so sad to see it fall into disrepair. James and his team could not have been more helpful and kind. We are heading to Coniston for our 10th anniversary this June but were hoping to at least get a cream tea at the Hotel but that looks unlikely. Let’s hope it’s back in business by our 20th! To be honest it is coming on really quickly now. Balconies overlooking the lake, and beginning to look loved again. Keep hearing little snippets of what it will be like finished. Loving the sound of the spa. Here’s hoping I get a chance to try it. Will definitely try and get permission to see the finished item and post pictures of the interior. Nothing wrong with booking an 11th anniversary trip!! I stayed at The Prince of Wales hotel on my first trip to the lake district about 25 years ago, it was an elegant hotel in beautiful surroundings and I would wander down to the lake near the boathouse before breakfast and in the late afternoon. The views were breathtaking and I always thought what a stunning location for a hotel, beautiful, tranquil, so relaxing, The hotel had a relaxed and pleasant atmosphere and the staff were friendly and helpful. I returned home so full of excitement and told my husband how good it was that we returned together the following year and it was just as good. Unfortunately when the hotel changed hands it appeared to be neglected and it was disappointing that it became so run down amid all the beauty of its surroundings. Now hopefully like a phoenix from the ashes it will rise again to be a hotel of great beauty to match its location. This is where I fell in love with the lake district and I would like to return again and re-live the memories. Due to its history I think it would be fitting to keep the Prince of Wales name for the hotel. Well the good news is, today as I went past they were working really hard on a new entrance, bedrooms now have balconies and it’s looking very positive. I know everyone that follows this blog is dying to see the finished result. No more than me. Will try to post photos as soon as possible but it is still a building site so can’t really gain access at the moment. Don’t think it will be too long till you can book a room as they have been advertising for staff. Not long now!. 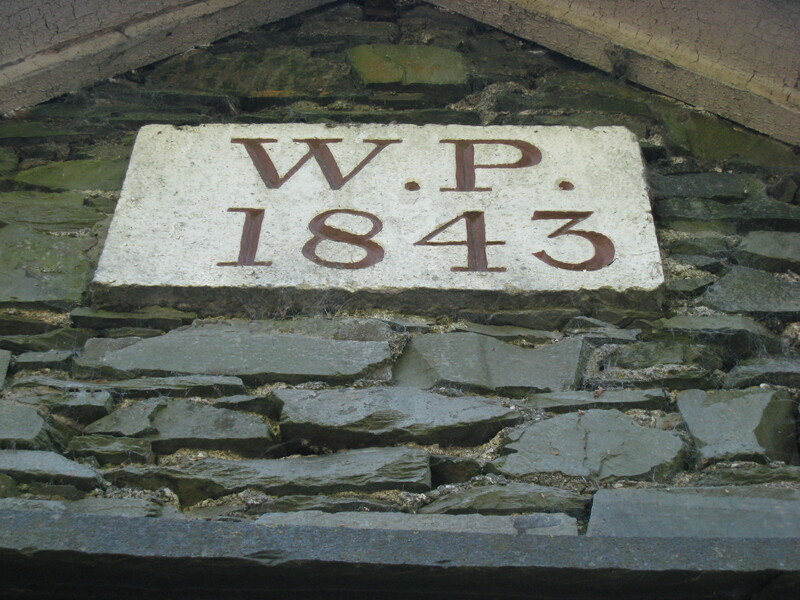 So happy that the P of W is being restored. We spent a night there back in 1996 while we were on a Globus Tour. I think we must have gotten the best room in the building. It was very Laura Ashley!! Such a beautiful setting. Loved it. Nice to know you have happy memories of your visit. I took a rowing boat out on the lake to have a look from a different angle the other day, and the views from the bedrooms should be stunning! Meant to be opening very soon. Will write a new post when it is open to let you have a look. My wife and I were guests at “The Prince” in 1973 during a wonderful visit to the Lake District. Now almost 40 years later we are going to visit again this September but we were saddened to see what has happened to the best hotel we had ever stayed at. We hope that it will be finished soon. Any chance we’ll be able to stay there? I would say you will be in luck. A sign went up today saying opening Summer 2012, so it is imminent. Hopefully I will get a chance to blog about the new hotel when it is open. 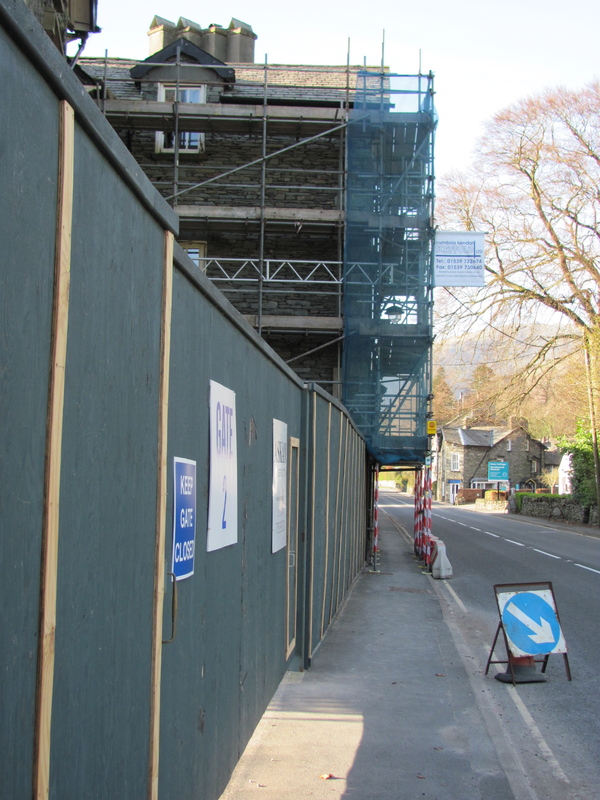 If not a quick “google” of Waterside Hotel Grasmere should give you info nearer your visit. We stayed here for our honeymoon 25 years ago and was looking forward to returning again this year. Hope this can still happen!! 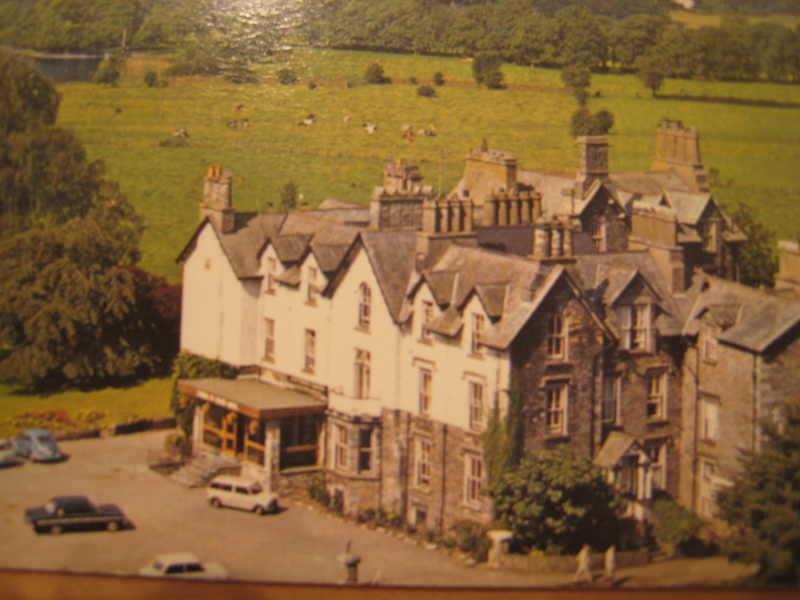 I worked at the Prince of Wales Hotel from 1966 to 1969 I met my late husband, Colin, at what was then the sister hotel – The Hydro Hotel at Bowness on Windermere. We both moved to the Prince of Wales, he as Head Chef and me as Head Waitress. Such fond momories. I still have some old menus and at least 2 soup plates marked with the coach and horses logo of the the Prince of Wales. Would love to see the old place working again. My father was manager of The Prince of Wales Hotel in the forties and as a ten year old girl I remember walking with my mother across the frozen lake to the island in the harsh winter of 1947! In the summer some of the staff would play rounders with me in the field. We lived in the cottage beside the hotel. It is a shame that the name of the hotel has been changed to The Daffodil but I hope the hotel will recover its former glory. What an amazing memory. Thank you so much for sharing it with us. I have seen the lake frozen, but not enough to walk to the Island!. The hotel seems to be “finding it’s feet”. It will take some time to get the grounds looking good but they are working on it. That was lovely of you to comment on my blog and I appreciate it very much. same goes for myself worked at pow between 1968-69 sadly never kept in touch with work friends I do not think I would know it now. I think I remember you Dolores from 1968 especially the head chef Colin cannot remember the head waiter but was his girlfriend Lily and she was Irish she had her younger sister working there as well. I was from Newcastle. I remember you and Colin from the POW hotel in 1968, my maiden name was McNally. I was a waitress in the dining room, I also remember Lily and also her sister who were Irish. I’m so sorry to hear about Colin. Used to Work behind the bar in 1974, had the time of my life. Met Chris Reekie, who we used to charge 2p less for his whisky because he drunk so much of it. It was because of him that my love of horse racing started, he took me to Sedgefield Races and that was me hooked. if Sue Savage reads this comment or anybody who remembers me can they contact me by email on ken@delphiseco.com, it would be great to catch up. Yes happy days. Chris might have been a Scotsman who liked his whisky, but I can vouch for the fact he still had his shop open 9o’clock on the dot every morning! He also used to do shows of his mohair goods in the Prince in the evenings after dinner for the American coach loads who were staying. In 1993 I was on an Insight tour travelling with my cousin through the UK. We stayed at the Prince of Wales as part of the tour and as we were two singles we were given separate rooms on the top floor via the beautiful staircase. Mine was the corner room which I would describe as a “little girls room” because of the sloped ceiling with the windows coming out through the roof which I had only ever seen in books. There was beautiful patterned wallpaper and a bird had built its nest in the gutter just outside my window. I was with Insight again in 2011 so I asked our guide to point the hotel out to me as it was such a wonderful place. He said that I would be disappointed as it was being refurbished and all I would be able to see were the hoardings. Our driver did slow down so I could see it and then we were on our way. Staying at the “Prince of Wales” was one of many highlights of our 1993 tour and it is a shame to see it “modernised”. In Australia, we do not have the history that you have which is one of the reasons we tour the UK. I was sad to hear of the Hotel being modernised, I know things have to move on but, I, have many happy memories of this lovely hotel. My brother John, I’m the youngest from a rather large “Irish” family, he, surprised us all and treated us ( there was, if I can rember 18 or 20 of us) in the mid 90`s , long, week-end ,New Year , in this hotel, I can tell you there were as many of us as staff. The manager, at the time, was absolutely brilliant, nothing was too much trouble to him, he even gave us, our own “staff” to look after our every need. We had full English breakfast, “lunch” then evening meal, the “lunch” would have filled most of us up. We had walks every day, through the villages, past Dove Cottage, Keswick etc, all, quite beautiful. The area around the hotel was spectacular, with the water lapping right on your door step, so to speak. All of us, could not fault anything in that hotel, from the staff to the Manager ( or was it the owner, I can’t rember) but, my brother John, he paid the whole bill and this is a small tribute to him for all he did for us all. As I’m very much into photography, I took hundreds of photos of the week end, as a record of our time there and I can still see the huge, grey chimney’s which stood high on the ends of the building with the mist coming off the water. I hope, that the future hotel/building will be, for others, give good memory’s to its new visitors as it has for myself and family. Great to hear another memory of the hotel. Many thanks for sharing.